As I find myself in the little cave at Bethlehem, I am not only in awe of this great mystery of the Incarnation- God becoming man; but I feel so humbled, so frail, and very much relating with the “little drummer boy” in not having a lot to bring, other than myself… my frail self. In fact, I don’t even play a musical instrument. But what I do sense in my heart to bring is the great love and affection that I have for Him, for Mary. Mary, on the other side of the manger from me, proceeds to kiss Jesus tenderly and caress His face, with tears in her eyes… because she knows.. she knows that He is Love personified…He is truly the Savior who will be rejected by many, and ultimately give His life for us. I rest for a while in the reality of this profound mystery before me, in the frail little way I am able; wit h great awareness of the Father’s loving presence shining down upon Jesus. I am very aware of the union of love between the Father and the Son; and the Holy Spirit which is sent forth to draw us into this mystery of communion as well. I am aware of humble, chaste St. Joseph as Jesus’ earthly father, caring for His needs and formation along with Mary on the natural realm; but I am even more so aware of our Heavenly Father’s providential care being at the heart of Jesus’ whole life and mission. From here my contemplation will branch off into the following two aspects which I plan to enter into interchangeably throughout the Christmas Season. 1). I find myself becoming one with Baby Jesus, opening myself to the Father’s eternal gaze of love and providential care for me; soaking in the truth of my own dignity and identity as a child of God; and also allowing Mary to hold, love, kiss, caress and nourish me as she does with baby Jesus; as she gazes into my eyes as such a perfect Mother. In this I bond with my Heavenly Father and Mother! 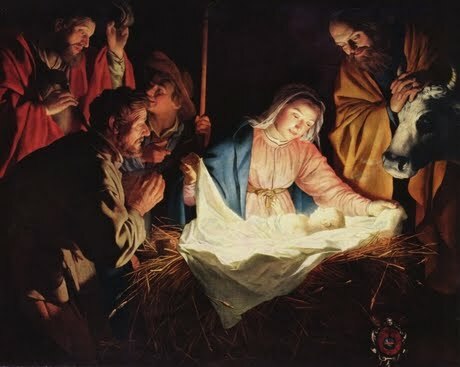 I pray that we may all have the grace throughout this Christmas Season to enter deeply into the mystery of the Incarnation. I share personal reflection of my own experience of this mystery. But I encourage each of us to encounter the Divine Christ Child personally in our own hearts. Jesus became flesh in order that we could relate with Him in a deeply personal and meaningful way. And, He is begotten again at every Holy Mass during the Consecration of bread and wine. May we not miss out on all the graces available to us.